Product Description PLEASE SEE SIZING GUIDE IN THE IMAGES SECTION BEFORE CHECKING OUT! 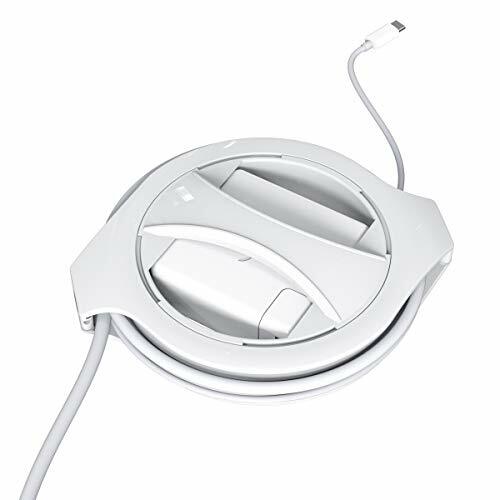 The Side Winder allows the user to wind, protect, and store their MacBook charger in under 5 seconds. The patent pending design was 1600% funded on Kickstarter, and is hands-down the best MacBook accessory. It's perfectly engineered for every MacBook user looking to organize, and store their existing charger, without wrestling it's unwieldy length. It works by using revolving rings that can wind up your charger with ease, eliminating the risk of the cable bending in strange ways. Just follow the simple instructions to install your charging cable inside, and you'll be able to gently pull to release the exact amount of cable you need, and simply turn the crank to wind it back in again. It even features a sleek, simple, monochromatic design that perfectly complements your laptop or other Apple products, and will slip easily into any bags or pockets. PLEASE SEE SIZING GUIDE IN THE IMAGES SECTION BEFORE CHECKING OUT! PORTABLE: The Side Winder fits easily into any pocket or bag with its sleek and low-profile design. 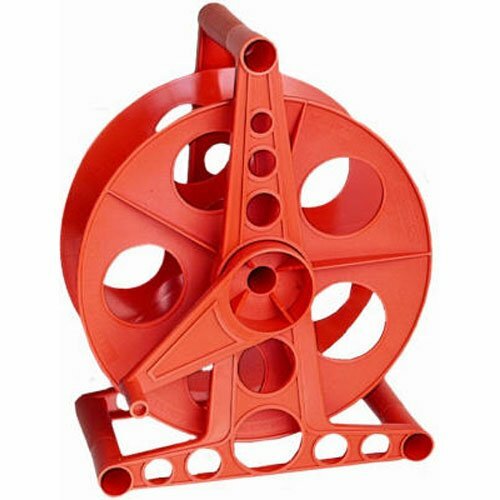 Designers Edge E102 Wire Cord Storage Reel, Red. Use for extension cords, holiday lights, rope, light wire, coax cabling, and more. Ideal for general storage of extension cords, holiday lights, and rope. Holds up to 150-feet of 16 gauge cord or 125-feet of 14 gauge cord. To operate, hold middle handle steady and spin the wheel with the other handle. 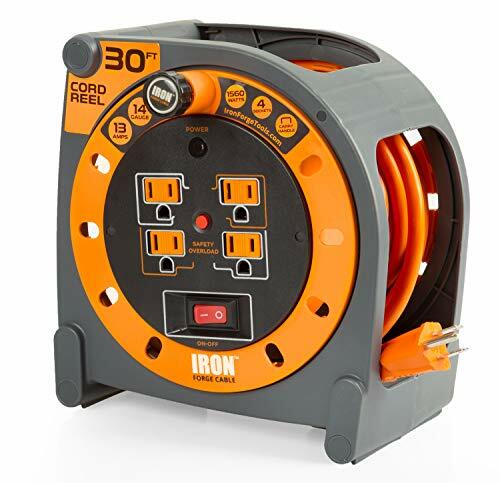 Tangle free extension cord storage reel. TOLL FREE HOTLINE, 1-800-561-4321. If you have immediate questions about application, installation, troubleshooting, or a damaged component, please call CCI Consumer product hotline at 1-800-561-4321 or email questions to: CCI.ConsumerSupport@southwire.com. The Designers Edge (R) brand is a registered trademark of Coleman Cable Inc. 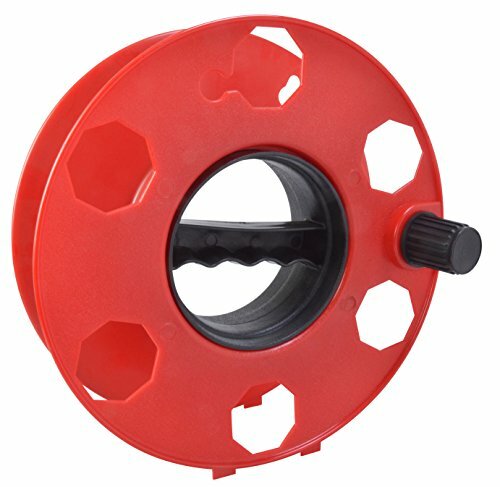 Designers Edge E103 Cord Storage Wheel, Red. Use for extension cords, holiday lights, rope, light wire, coax cabling, and more. Ideal for general storage of extension cords, holiday lights, and rope. Holds up to 150-feet of 16 gauge cord or 125-feet of 14 gauge cord. To operate, hold handle steady at the top of the reel, pull rotating lever to move cord reel in desired direction. Holds up to 150-feet of 16/3 gauge cord when guided neatly - if thicker cord, less length will be organized. Recommend to set on ground while wrapping cord. Convenient handle allows you to unwind your cords quickly for easy access. The Designers Edge (R) brand is a registered trademark of Coleman Cable Inc. Product Description PLEASE SEE SIZING CHART IN THE IMAGE SECTION BEFORE CHECKING OUT! The Side Winder allows the user to wind, protect, and store their MacBook charger in under 5 seconds. The patent pending design was 1600% funded on Kickstarter, and is hands-down the best MacBook accessory. It's perfectly engineered for every MacBook user looking to organize, and store their existing charger, without wrestling it's unwieldy length. It works by using revolving rings that can wind up your charger with ease, eliminating the risk of the cable bending in strange ways. Just follow the simple instructions to install your charging cable inside, and you'll be able to gently pull to release the exact amount of cable you need, and simply turn the crank to wind it back in again. It even features a sleek, simple, monochromatic design that perfectly complements your laptop or other Apple products, and will slip easily into any bags or pockets. PLEASE SEE SIZING GUIDE IN THE IMAGE SECTION BEFORE CHECKING OUT! The USB-C model is not interchangeable with the MagSafe model. Please ensure you are purchasing the right model winder. Bayco prides itself on making the Nighstick line of security, safety, and protection lighting for decades. Whether on tactical applications, using at home, or outdoors, Bayco fills the gap for all crevices large and small. See larger image. 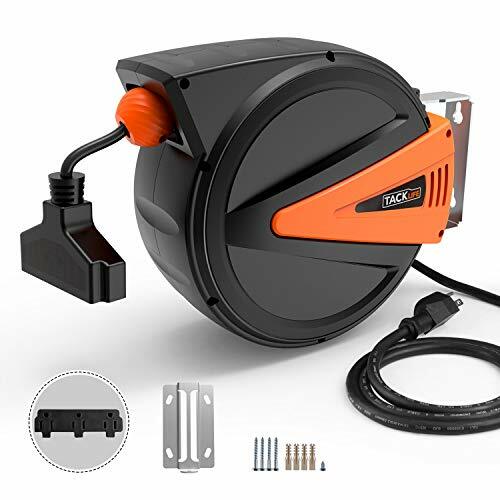 Featuring three separate grounded outlets and a 10 amp rating, the Bayco SL-800 Professional Retractable Reel makes powering your projects is quick and easy with its 30-foot 16/3 SJT cord. Simply pull out what you need and when you're done, all the cord winds back up inside the heavy-duty metal housing. The outlet bar even has a built in LED status light to let you know you have power. Includes mounting brackets that allow it to be attached to the wall or ceiling. About Bayco After 29 years of building professional grade task lights, Bayco Products, Inc. continues to revolutionize professional task lighting through experience, engineering, innovation and technology. Our extensive product line encompasses portable, rechargeable and non-rechargeable lighting products, cord and cord management solutions each designed to provide reliable, affordable solutions for aerospace, industrial, petro-chemical, public safety, automotive as well as household work areas. As experts in task lighting, the personal safety of our professional and non-professional customers is paramount to Bayco. This is ultimate cord storage reel. It stores up to 125 feet of 14/3 cord and 150 feet of 16/3 cord. 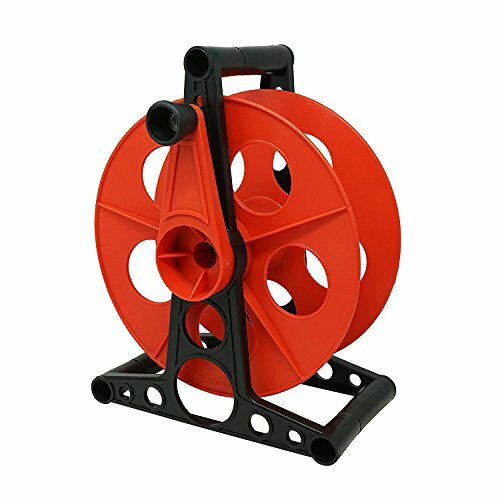 It is also suitable for use with rope, air hose, dock lines, or ski ropes. This product is perfect for contractors, home owners, RV owners, mechanics, and service technicians. It is constructed of heavy duty, high impact material for durability. Can be mounted on wall or carried for portability to the job. WARNING: This product can expose you to chemicals which is [are] known to the State of California to cause cancer and birth defects or other reproductive harm. For more information go to www.P65Warnings.ca.gov. 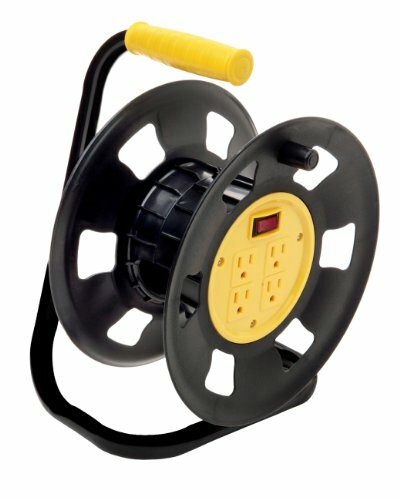 Master plug's easy-use open reel is perfect for use in workshops, homes, yards, and light industrial applications. The integrated cord is kept neat and ready-to-go and 4 surge protected outlets ensure you have power where you need it. The rugged open reel design allows for easy storage using the master plug wall mount bracket (sold separately). Master plug's reels are backed by our three year warranty and our customer support team, located in Houston, Texas, is ready to help you, Monday through Friday. 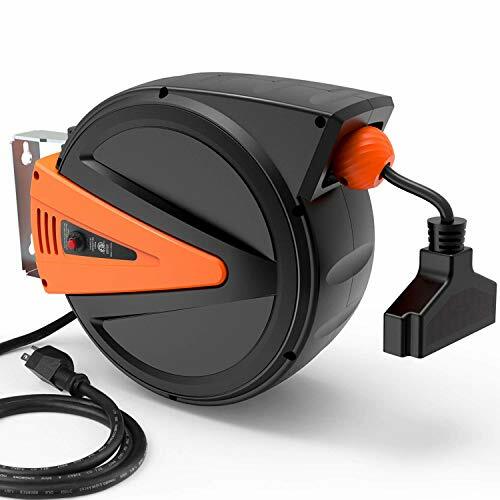 The zillareel retractable cord reel comes pre-loaded with 50 ft. Of heavy gauge oil and cold-weather resistant cord and will store your extension cord until needed, eliminating tangles. 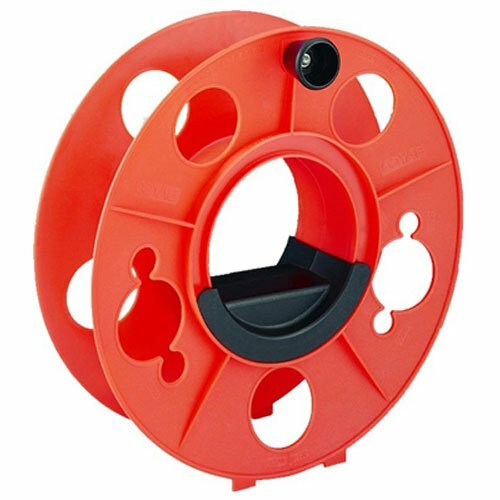 The zillareel case is made of impact resistant polypropylene, making it lightweight and compact. 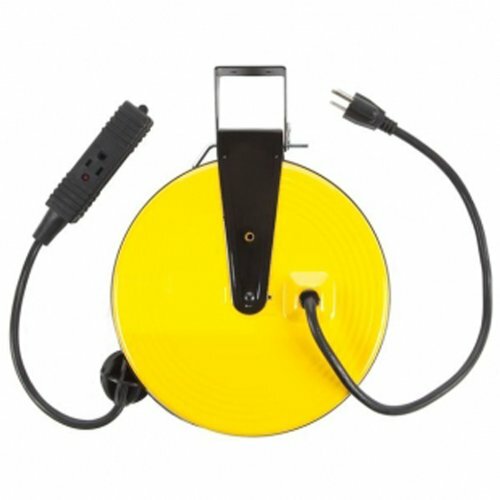 This retractable cord reel is ideal for general, commercial and industrial use. CORD locks out in 3 ft. Increments and is recommended for indoor/dry locations. 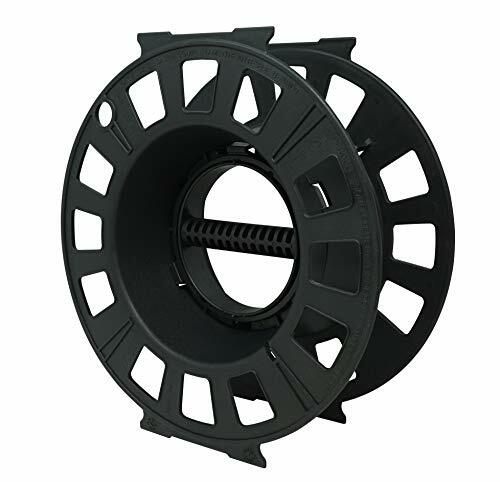 Master plug's easy-use case reel is perfect for use in workshops, homes, yards, and light industrial applications. The integrated cord is kept neat and ready-to-go and 4 surge protected outlets ensure you have power where you need it. The rugged case reel design allows for easy storage using the built-in wall mount option. Master plug's reels are backed by our three year warranty and our customer support team, located in Houston, Texas, is ready to help you, Monday through Friday. With 4 power outlets, you can run multiple electrical devices simultaneously. The extension cord is both water resistant and flame retardant. The vinyl covering protects the cable against abrasion and direct sunlight. The cord's orange color is highly visible for extra safety. 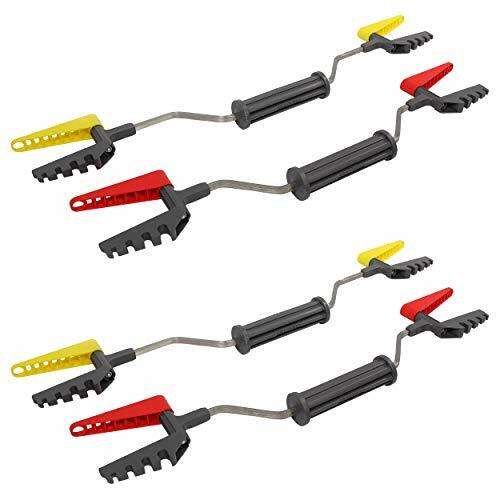 And the plug offers reinforced prongs that won't bend or break when you use them. 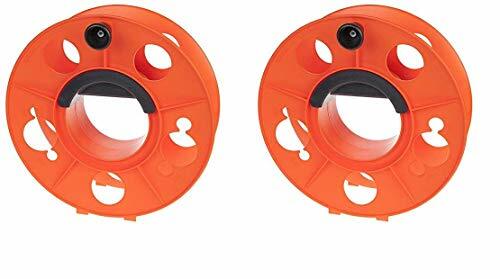 Cord reel heavy duty, ext cord reel, reeled extension cord, cord reels, reel electric cord, reel cord, reel electrical cord, extrnsion cord reel, electrical cord reel, 14-3 extension cord reel, reel power cord, 143 extension cord reel, extension cord reels, orange cord reel. Tacklife Professional team on Amazon, which deals only with development of the tools. We commit ourselves to using qualitative tools to improve the quality of life. Smart locking system enables you to stop the power extension cord at any length you want. Pull once, it tops at any length you want; pull twice, it is released. So on and so forth. Circuit breaker will protect the device from damagebecuse Press the red button, Cord reel can be re-used. 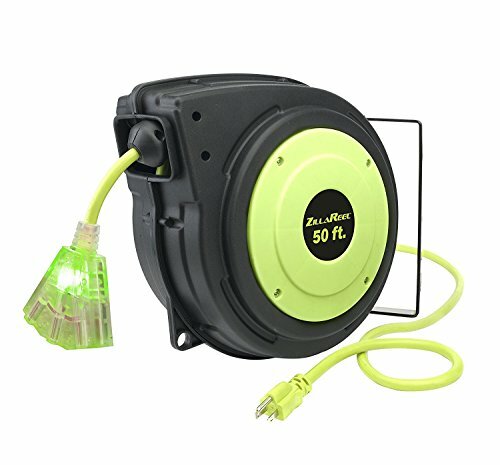 180 Rotation wall mounting is a huge coverage, which allows the power extension cord reach anywhere you want to reach and a great saving of space . Triple Tap Connector 50 FT power cord 14AWG3C-SJTOW and grounded 4.5' lead-in cord meet most of your work requirements. The Wonder Winder holds 150 feet of cord and winds 100 feet of cord in 30 seconds. It is portable and can be used indoors and outdoors. Cord not included. Reversible handle can be used right or left handed. The Wonder Winder ends extension cord spaghetti for good. With the Wonder Winder, you'll never have to waste time untangling and coiling extension cords again. 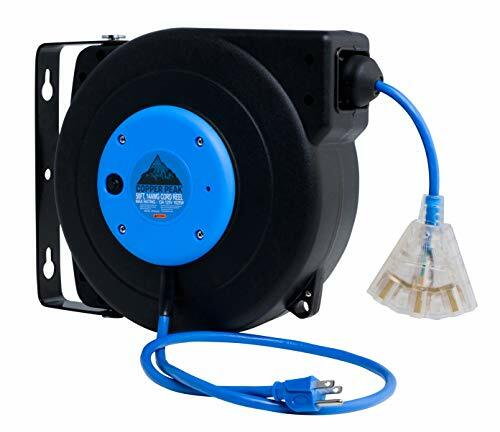 It comes with two twist-lock mounting plates that attach to a wall of your shop, garage, or basement, or outside of your house--anywhere you have an outlet. You can then just move the Wonder Winder from one location to another as you need it. The unit's basket holds up to 75-feet of 12/3 cord, 100-feet of 14/3 cord, or up to 150-feet of 16/3 cord. 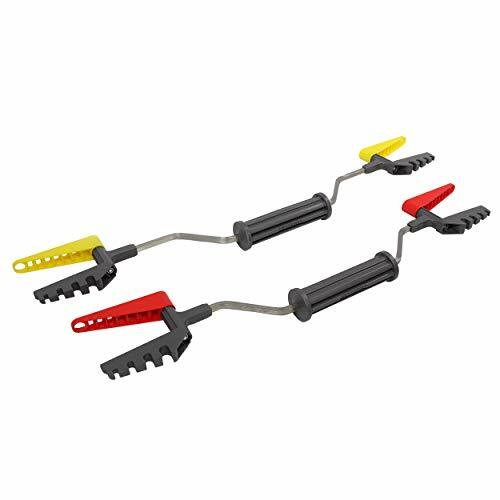 Simply plug your tool into the cord end, and as you walk to your work area the cord follows. When you're done, press the rewind lever, turn the handle, and your extension cord is stored neatly for future use. And it's quick, too--the Wonder Winder pulls in 100 feet of cord in about 30 seconds. The reversible handle can be used right or left handed. It's backed by a 3-year warranty. Assembly required (see a schematic of all the parts). Cord not included. 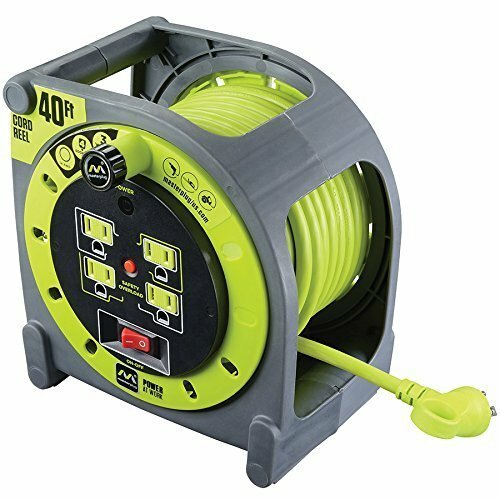 Designers Edge E230 Extension Cord Reel and Storage, Black/Yellow. For use with storage of extension cords and similar cabling. Holds up to 50-feet of 12 gauge, 70-feet of 14 gauge, or 90-feet of 16 gauge cords. Features grounded outlets with built in circuit breaker, for safety and protection. Comfortable grip allows for quick and easy transportation of unit. Will convert most extension cords into 4-outlet power block. On/off switch lights up when unit is powered. UL & cULListed, two important industry standards for safety and longevity. TOLL FREE HOTLINE, 1-800-561-4321. If you have immediate questions about application, installation, troubleshooting, or a damaged component, please call CCI Consumer product hotline at 1-800-561-4321 or email questions to: CCI.ConsumerSupport@southwire.com. The Designers Edge (R) brand is a registered trademark of Coleman Cable Inc. If your digital gadgets are taking over your home or office, Prosumer's Choice is pleased to offer a perfect solution for organizing tablets and smartphones so you reclaim much-needed desk or counterspace. This hybrid organizer functions as both a large yet discrete storage box and an elegant charging station with a sleek natural finish that blends in with any decor while hiding the cables that charge up your devices. This innovative solution can dock up to seven tablets, phones or eBook readers while the high-capacity base means you can store laptop adaptors, USB hubs, surge protectors and more. The top rack allows you to store up to 7 electronic devices so they're always in one easy to manage, easy to find location. The rack's raised edges mean you can also use it as a valet desktop tray or compartment to keep jewelry, keys, spare change, wallets, watches or other easy-to-lose items you might need day-to-day. This can be used as a handy bathroom countertop organizer that conveniently holds your hair clipper, shaver, beard trimmer, electric razor, nose and ear hair trimmer giving you back your counter space, This large container features anti-slip rubber feet to keep your new accessory secure along with three sticky hook-and-loop fasteners and adhesive strips to keep cords and chargers in one place. 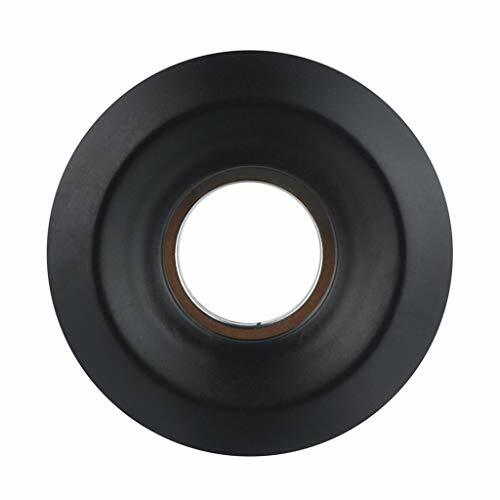 Vented slits allow better airflow to safely manage and protect your equipment. 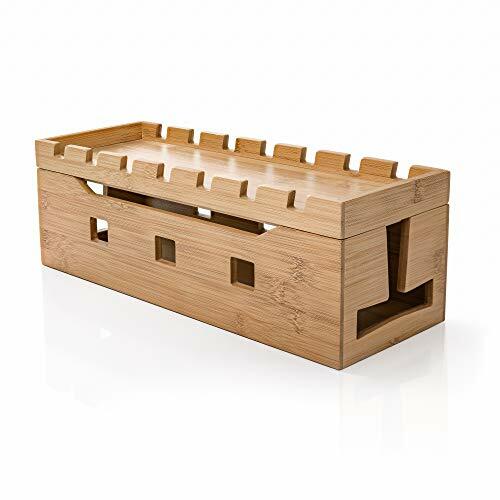 Finally, this entire unit is constructed from beautiful, sturdy and heat-resistant natural bamboo, resulting in an environmentally friendly, space-saving accessory holder for floors, desks, bathrooms, kitchen counters and nightstands. Reclaim your lost space! The Dura-Winder is a next generation cord, rope, and cable organization tool. 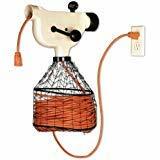 Untangle and organize your cords and rope of any size; the Dura-Winder has a 4 in 1 spine multi-catch that fits Imperial 3/8 inch, 5/16 inch, 1/4 inch, and 3/16 inch cords, and Metric size 10, 8, 7, and 5 cords. The 360 degree pivoting arms allow you to quickly release your cord or hang the Dura-Winder vertically, horizontally, or at an angle for easy storage. The pivot arms are constructed with impact-resistant composites and designed with multiple hanging points that you can fit over any hook or nail. The ergonomic design features a composite center grip for handling and balance; the Dura-Winder is built to last with high-grade 304 stainless steel. 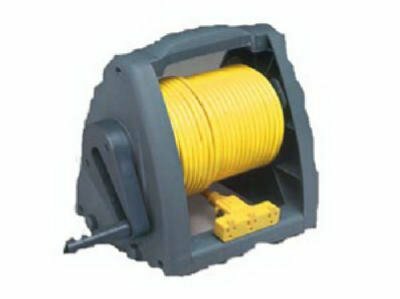 You can use the Dura-Winder to wrap up extension cords, cables, air compressor hoses, dock line ropes, Christmas lights, ski tow rope, power cords, and rock climbing rope. This combo 2 pack includes 1 medium and 1 large Dura-Winder to make your everyday tasks with cords and rope easier. The Dura-Winder is a next generation cord, rope, and cable organization tool. Untangle and organize your cords and rope of any size; the Dura-Winder has a 4 in 1 spine multi-catch that fits Imperial 3/8 inch, 5/16 inch, 1/4 inch, and 3/16 inch cords, and Metric size 10, 8, 7, and 5 cords. The 360 degree pivoting arms allow you to quickly release your cord or hang the Dura-Winder vertically, horizontally, or at an angle for easy storage. The pivot arms are constructed with impact-resistant composites and designed with multiple hanging points that you can fit over any hook or nail. The ergonomic design features a composite center grip for handling and balance; the Dura-Winder is built to last with high-grade 304 stainless steel. 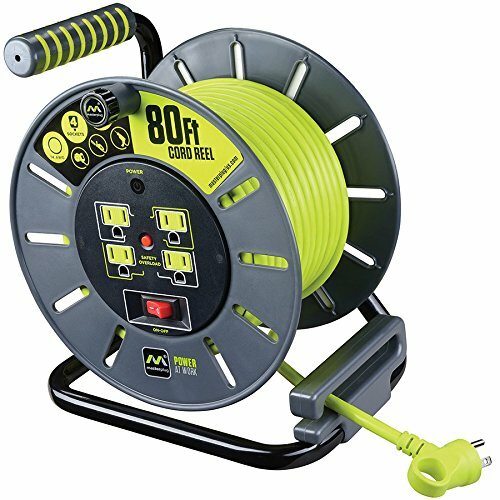 You can use the Dura-Winder to wrap up extension cords, cables, air compressor hoses, dock line ropes, Christmas lights, ski tow rope, power cords, and rock climbing rope. This combo 4 pack includes 2 medium and 2 large Dura-Winders to make your everyday tasks with cords and rope easier. Automatic - Cord Tangle-Free Portable Manager stores most standard-size earbuds, earphones, power cords and other cables without volume control/microphone in seconds. Portable - The lightweight and compact design makes it portable to be put in your pocket, handbag, backpack or carry-on luggage so it is always available when you need it. Constructed from aluminum alloy giving it exceptional strength for heavy duty work. 10-LEVEL BRIGHTNESS: Designed with 10 adjustable brightness for you choose meet all your needs in different circumstances. 3 MODES: white warm yellow warm yellow + white. It will come in handy whenever you need extra light for making up taking photos making videos reading books and live streaming. ADJUSTABLE TRIPOD: A light tripod stands attached to allow you to adjust the height from 35cm/13.8" to 100cm/39.4". It will meet all the situations you need. MULTIPLE-PURPOSE: Equipped with adjustable tripod heights and light brightness it can be used as desktop lamp or floor lamp as you like. Suitable for living room study room baby room bathroom conference room etc. QUICK-RELEASE PHONE HOLDER: Universal cell phone holder with 360 rotation very easy to use. USB POWERED LED LIGHT: USB power driven lamp provides you more convenience. You will be able to enjoy both the lamp and the cell phone holder at any time freely. COMPATIBLE: Compatible with most of smart phones. Constructed from aluminum alloy giving it exceptional strength for heavy duty work. 10-LEVEL BRIGHTNESS: Designed with 10 adjustable brightness for you choose meet all your needs in different circumstances. 3 MODES: white warm yellow warm yellow + white. It will come in handy whenever you need extra light for making up taking photos making videos reading books and live streaming. ADJUSTABLE TRIPOD: A light tripod stands attached to allow you to adjust the height from 35cm/13.8 to 100cm/39.4. It will meet all the situations you need. USB POWERED LED LIGHT: USB power driven lamp provides you more convenience. You will be able to enjoy both the lamp and the cell phone holder at any time freely. COMPATIBLE: Compatible with most of smart phones. Connects tape deck to standard North American wall outlet or power strip. Best for safety and performance. 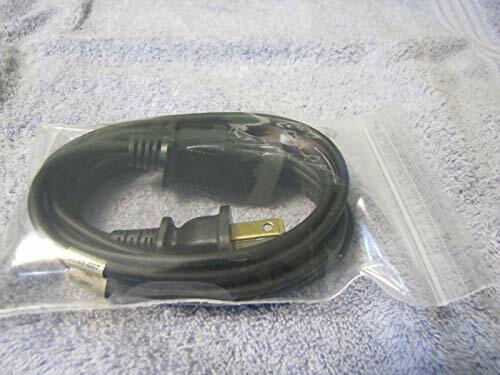 ***NOTE*** Make sure your tape deck has an "AC Power In" connector similar to the one pictured. The same connector on Sony Tapecorders are usually labeled "Power Supply". New cord modified to fit TEAC, SONY, PIONEER, SANSUI reel to reel tape recorders. Replaces obsolete cords. No modifications to male end of cord. Female end modified to exactly fit recessed two prong connectors common on TEAC and SONY reel to reel tape decks and labeled "AC POWER IN" or "POWER SUPPLY"
New power cord, modified connector for perfect fit to 2 prong connector socket (like the example pictured) on Teac, Pioneer, Sony, Sansui reel to reel tape decks. OEM power cords for these decks are obsolete and no longer produced. This is a brilliant replacement for the discontinued OEM power cord. High quality cord. Please carefully compare specification details with others claiming higher quality.